The independently-owned Connecticut and Rhode Island Beverage Journals are the official monthly print market guide and online resource connecting thousands of licensees to distributor brand price listings and market news. We are the only print and digital resource that delivers alcohol pricing, brand information state-by-state, along with industry news and events, to licensed professionals. In print, the brand and price listings are accompanied by current trade news and reporting about market products, people, places, trends and issues. Online, trade and licensed professionals search, shop and order products directly to wholesalers via a secure, trade-only site and iOS app, each of which offer a real-time extension from the monthly print brand index plus suite of tools to support your business, including access to current product ratings, bottle shots and spins, tasting notes, shopping list management and history, sell sheets creation and so much more. The secure site and app each host multiple reporting capabilities for retail and bar staff and wholesalers and sales teams with just a few clicks. The Beverage Journal has adapted to over 70 years of change by creating flexible, evolving platforms to meet wholesaler needs in delivering product and pricing information to the marketplace, and in creating local market efficiencies for the buying and selling trade. Along with our network partner, Beverage Media Group, we offer trusted one-stop marketing and communication resources for the liquor industry. 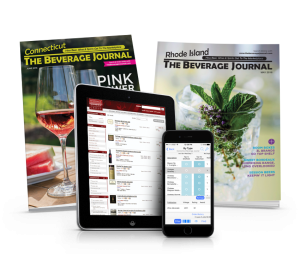 The Connecticut Beverage Journal is published by Beverage Publications, Inc., and The Rhode Island Beverage Journal is published by Rhode Island Beverage Journal, Inc., located in Hamden, Connecticut.